1) Arrange the data sets from least to highest. 2) Find the values of the 3rd quartile (Q3) and the 1st quartile (Q1) values by using the locator's formula: c = k(n)/4. where k is the quartile and n is the number of values (observations). a) If c is a whole number, the quartile value is the average of the values at c and c + 1.
b) If c is not a whole number, the quartile value is the value at the integer when c is rounded off. 3) Subtract Q3 and Q1. Find the IQR of the data set: 12, 4, 5, 6, 9, 10, 8. 1) Order the data set from lowest to highest. Round 5.25 off to 5, so Q3 is the 5th value in the set which is 9. Finding the IQR is simple with small data sets, but it is easier to use the app for larger ones. 1) Enter the data set as a matrix. Notes: We use 0.75 for Q3 since it's the value at the 75th percentile of the data. 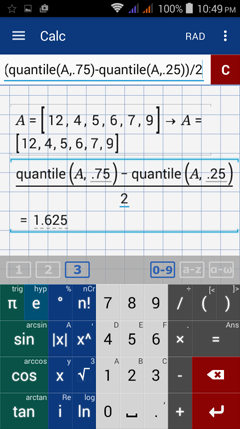 There is no button for quantiles, so you need to type the command using the a-z keyboard. Note: We use 0.25 for Q1 since it's the value at the 25th percentile of the data. 4) Find the difference between the results in steps 2 and 3. Find the IQR for each data set. 2) Enter the data set as a matrix. 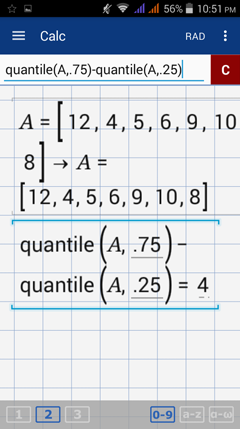 The quartile deviation is half of the IQR. It can be found by dividing the IQR by 2. 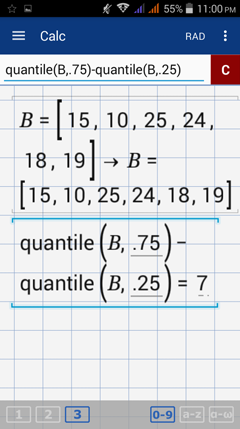 Use the syntax: (quantile (A, 0.75) - quantile (A, 0.25)) / 2. 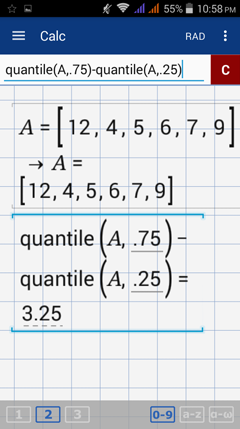 Find the quartile deviation for each data set.